Budapest may be the main tourist location on the Danube in Hungary, but it is far from the only. Scattered upstream from Budapest are several wonderful locations to visit — the Roman ruins of Aquincum, the wonderful city of Eztergom, and the tiny Baroque suburb just a short bus ride from Budapest known as Szentendre. Szentendre (sen-TAHN-dray) is a quaint little town with a tight maze cobblestone streets, lots of shops, and several churches, all overlooking a peaceful section of the Danube. 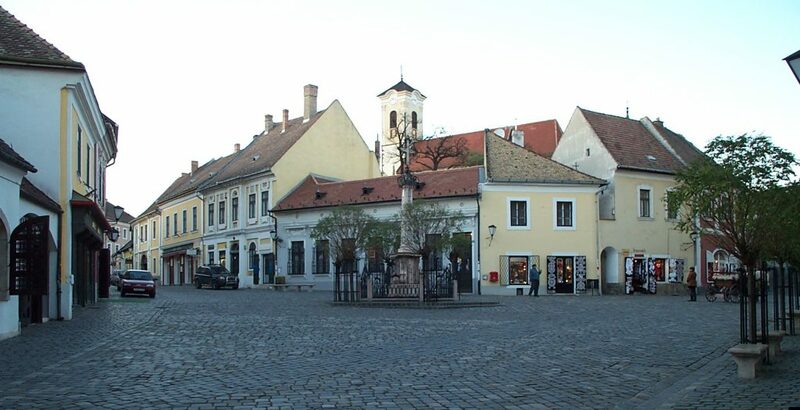 The town was quiet as this was a Sunday in the middle of November back in the early 2000s–Szentendre is far more active in the summer months. 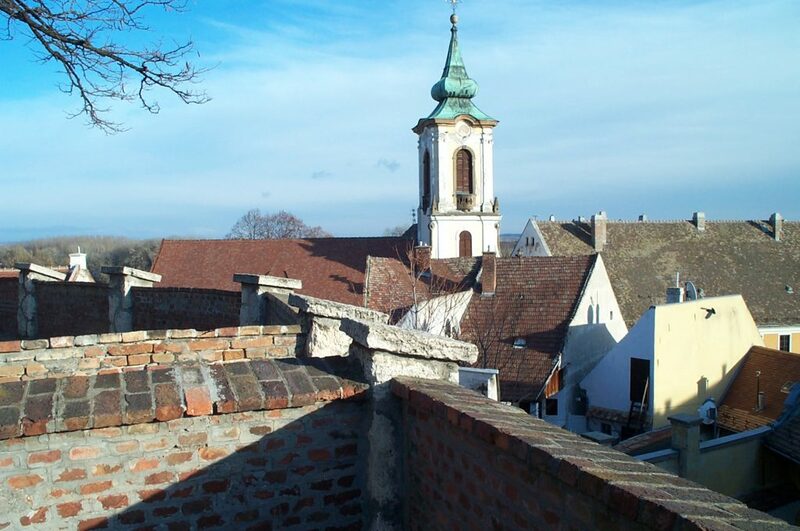 Szentendre is rich in religious diversity. The below picture shows the uppermost part of the town, with its Roman Catholic church in full viewm, taken from the observation wall of a Serbian Orthodox Church in the background. On the Orthodox church grounds is a beautiful museum. Not pictured, but within a block from here, are a second Catholic church, plus Calvinist, Lutheran, and Baptist churches scattered about. However, the greater draws to Szentendre are the shopping and eating. 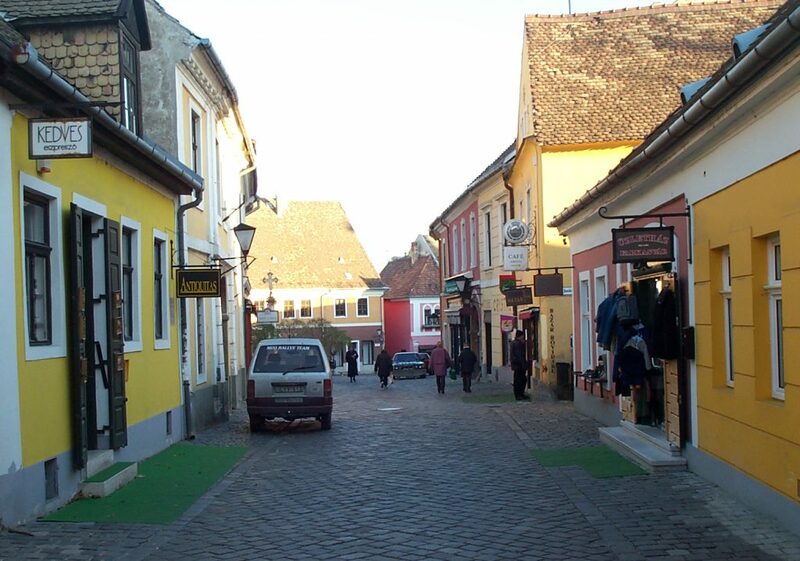 From the town center, shown at right, to the kilometer-long winding main street, Szentendre has plenty of shopping. More than just souvenir stands, the shops offer a wide variety of Hungarian goods — especially wines, jams, and cloth. Interspersed are several art galleries and museums, many of which are dedicated to the works of a single local artist, and all are worth a short visit. A high bank protects the town from the occasional flood, but you can walk along the top of the bank in the summertime. Like Dresden, Szentendre has a river taxi service that is a great summer alternative to the train if you wish to go to/from Budapest. To be sure, any transport to Szentendre in the summertime is going to be packed with people. 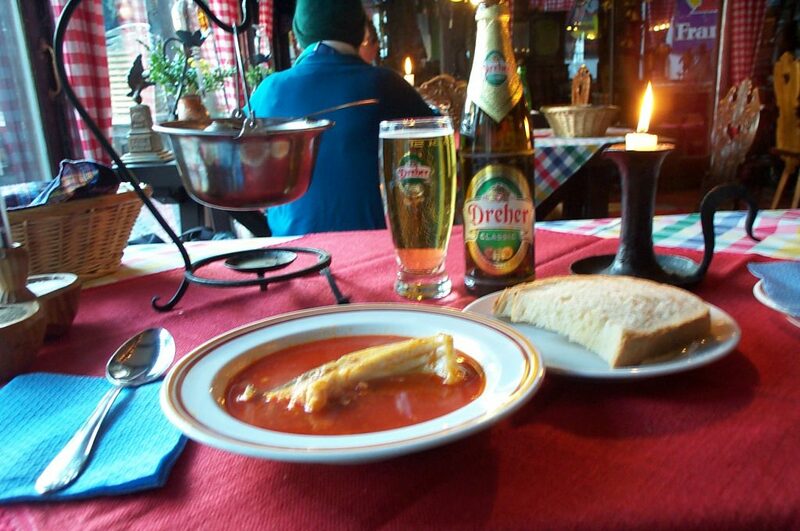 Finally, Szentendre is a great place to dine. 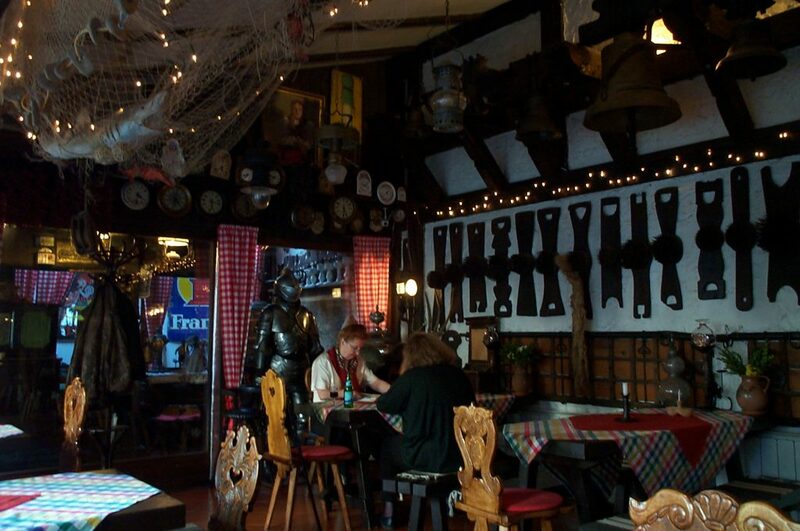 The abovepicture was taken inside one of the town’s restaurants. In few other places have I seen such an eclectic collection of antiques. The food was absolutely top notch as well, and like in much of Hungary, the prices were quite reasonable. Below is the meal I had of fish soup held in a decorative little pot heated with a candle. The beer is Dreher Classic, locally brewed in Budapest. I loved Szentendre, and so will you.